The land of 10,000 lakes has, well, a lot of lakes to look at, but we offer so much more—like trees. We offer a lot of those, too. But perhaps you don’t live in Nevada, and have seen bodies of water and trees before. Minnesota has more historical, natural, odd, cultural, and even entertaining sights to see than we’re usually given credit for. Minnesota is rather flat (it’s true) and at times can seem to be an endless ride that will only end when Britney Spears learns how to control herself—which is another way of saying, the drive may seem like it will never end. But don’t fret, the roadside attractions are plentiful and interesting. 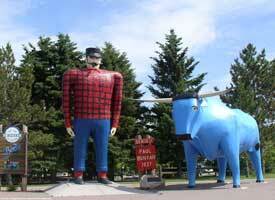 Like, did you know that Minnesota features many of the worlds largest items? We do! Virginia has the largest floating loon, or, perhaps, you would like just a big loon, which is in Vergas. Loon not your bird of choice? Pelican Rapids has, well, what else but the world’s largest pelican. Don’t forget the turkey in Frazee or the prairie chicken in Rothsay. But in the nonbird category, we sport a giant hockey stick in Eveleth (only the second largest), but that will go well to play a little one-on-one with our famous Paul Bunyan and Babe the Blue Ox (Bemidji) versus Jolly Green Giant (Blue Earth), with an Iron Man (Chisholm) to referee. For more roadside sights, and there are many, you can visit <www.roadsideamerica.com/map/mn.html>, while taking a restroom break in Belle Plaine with their two-story outhouse (don’t ask how that works). Being true to our NFL team (we also have NBA, WNBA, and MLB teams), we provide a little history on the true Vikings themselves. Alexandria has some historical Viking sights. Depending on which part of the start you wish to visit, Duluth and Moorhead both have Viking ship replicas, the latter an entire museum devoted to the history of Vikings—a must-see. Let’s not forget the Mississippi River or Lake Superior when thinking of the Vikings. As long as we are staying true to Minnesota heritage, we do have a lot of lakes, rivers, and trails to be explored for the outdoorsman in all of us. Anything from hiking, camping, and biking to canoeing, kayaking, and fishing, we’re got it and are proud of it. Visit <www.trails.com> to find just the right activity. On the banks of Lake Superior sits the beautiful city of Duluth. Bordering the world’s largest fresh-water lake, it’s just natural that many of the city’s sights and sites would be along the shoreline. Make sure to walk/bike/blade along Lakewalk. Just more than four miles long, it is a beauty to behold and lets you visit the Waterfront Sculpture Walk—a series of prized sculptures representing Duluth in every aspect. But as Minnesota is famous for having nine months of winter, the outdoors is sometimes not the best idea, and some indoor activities are needed. Duluth is known for America’s only all fresh-water aquarium. The city also has a great variety of art galleries, orchestras, theaters, and museums. If museums are what you’re looking for, though, look no further than Minneapolis-St. Paul, which features more than 20 varieties of them. Most notable are the Science Museum, Minneapolis Institute of Arts, and Walker Art Center. Minnesota’s culture doesn’t stop at museums. From the historic Orpheum that opened in 1921 to the newly rebuilt and beautifully designed, Guthrie Theater, Minneapolis offers a variety of shows. Every show needs music and the Twin-Cities certainly has that. The Minnesota Orchestra is based in Minneapolis, but across the Mississippi River is the Saint Paul Chamber Orchestra. Two not enough? Try the Ordway Center for the Performing Arts and Greater Twin Cities Youth Symphonies. Not everyone enjoys art, live shows, or mosquitoes (which we’re sadly very famous for), and for those who want something more mainstream, there are things for you, too. As we like to be big in everything we do, we have The Waterpark of America and the Mall of America. The largest (a running theme in Minnesota) is the Waterpark of America. Raising more than 90 feet into the air, this isn’t just for kids. It features, of course, waterslides and pools, but also tubing and some surfing practice. Only a short distance away is the pride of Bloomington, the Mall of America. One of the greatest tourist attractions in America, surely it is a site to be seen. With more than 500 stores to choose from, one would think that would be enough. But the MOA is a shopping district with everything. Nearly 90 food choices should keep every type of eater happy. Not to be outdone by shopping, the mall features a full amusement park—indoors—and an aquarium filled with sharks. Oh, we can’t forget the most important thing: Minnesota doesn’t tax clothing. Big or bigger, Minnesota is not to be overlooked anymore by those wishing to see it all. There’s nothing someone could want to do on vacation that Minnesota doesn’t offer. Every state has a tourist destination; Minnesota has them all and some. Prove us wrong, and we might just build the biggest one in America. For a full list of things to see and do, visit <www.minnesota.worldweb.com>.